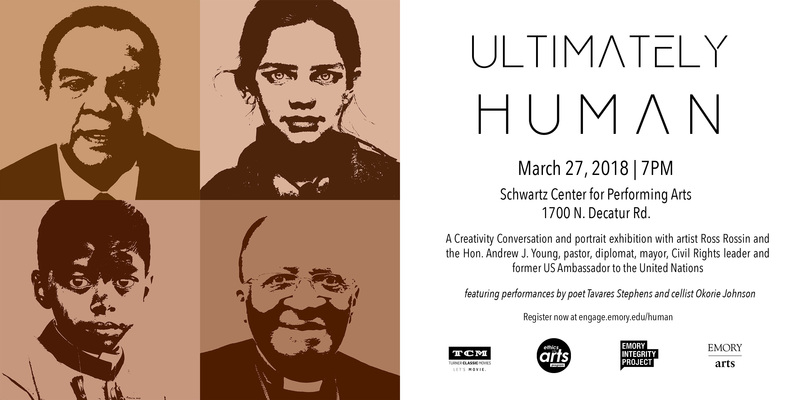 Civil rights icon Andrew Young and renowned portrait artist Ross Rossin, Emory’s Schwartz Artist-in-Residence, will meet for a public conversation, titled “Ultimately Human,” on March 27 at the Schwartz Center for Performing Arts. 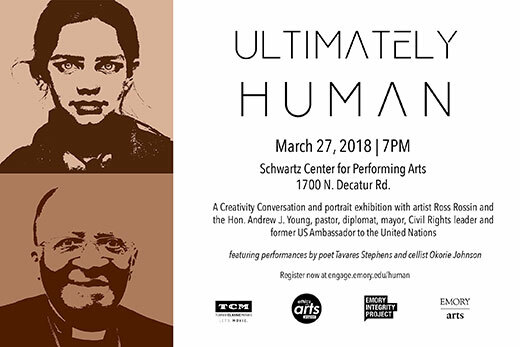 Former ambassador and civil rights icon Andrew Young and renowned portrait artist Ross Rossin, the Schwartz Artist-in-Residence at Emory University, will meet for a public conversation, titled “Ultimately Human,” at 7 p.m. Tuesday, March 27, at Emory’s Schwartz Center for Performing Arts. Admission is free, but attendees are asked to register in advance. Rossin will display onstage many of his extraordinary portraits, while he and Young use them to reflect on questions of identity, how it informs our view about others, the creative process, artistic meaning and the beauty in diversity. Young served as director of the Southern Christian Leadership Conference and worked closely with Martin Luther King Jr. He was elected to three terms in the U.S. House of Representatives, was appointed by President Jimmy Carter as the U.S. ambassador to the United Nations and served two terms as mayor of Atlanta. Rossin’s photorealistic portrait of Young debuted in 2009. The March 27 program also will feature poet and spoken word performer Tavares Stephens, and cellist/filmmaker Okorie Johnson, who performs under the name OkCello. Rossin’s residency at Emory coincides with FACE, the Frankenstein Anniversary Celebration at Emory, a year-long university-wide celebration of the 200th anniversary of the novel, and is part of the Ethics and the Arts Program at Emory’s Center for Ethics. Last fall, Rossin began his residency and helped launch the Frankenstein bicentennial on campus by unveiling a compelling portrait of a new interpretation of Dr. Frankenstein’s creation, described by Mary Shelley in her 1818 novel. The event is the first of the newly renamed Rosemary Magee Creativity Conversations, a series of public conversations on campus highlighting creativity and imagination as essential to every discipline and enterprise. By putting distinguished visiting thinkers and creators in conversation with one another and members of the Emory community, Rosemary Magee Creativity Conversations give audiences access into the innovative minds and creative processes of leaders in a wide range of fields. Turner Classic Movies is the exclusive corporate sponsor of this event and is a corporate partner of the Ethics and the Arts Program at Emory’s Center for Ethics. The Schwartz Center for Performing Arts is located at 1700 North Decatur Road, Atlanta, Georgia, 30322.